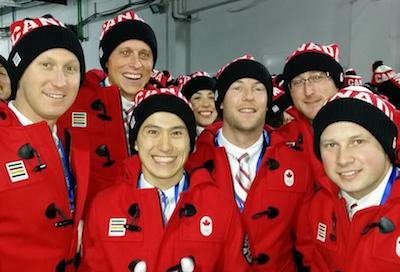 Ryan Fry write a Blog about Team Jacobs experience so far at Sochi. There was a lot of anticipation for our team. We’ve been off the ice for 20 days now since the World Financial Group Continental Cup, so just to get back out there competing was huge. I couldn’t have asked for a better morning. Maybe a couple more shots here or there, but we still ended up with the result we wanted, an 11-8 win over Germany. The atmosphere in the building was amazing! The Russian fans were very loud with their chants and horns. It took a few ends to adjust, there’s no kidding ourselves. It definitely took three or four ends to get used to that. There were a lot of horns in your backswing and a lot of background noise coming all the time. It takes a different level of concentration, for sure. But it’s sure better than a quiet building! We arrived in Sochi last Tuesday, and it’s been an amazing experience for Brad, Ryan, E.J., Caleb and me. We’ve been spending a lot of time meeting the athletes, which is one of the things we wanted to do most of all. Life in the athletes’ village is a wonderful experience. It’s a big place and there’s a lot to do out here. We’ve been in the dining hall and there’s a really nice gym that we’ve been attending daily. I went outside the village and went through Adler and Sochi, which was nice. Everywhere you go, the people are friendly and it’s pretty easy to meet people. That’s the best part of this. Opening ceremonies night — that’s us with Patrick Chan! The opening ceremonies were an experience I’ll always remember. The energy with the rest of the Canadian team as we were waiting to go into the stadium was really something that I’ve never experienced. And then to actually go into the stadium with my teammates and friends all around me was a special moment. I’ll bet it looked amazing on television. In person, it was spectacular, although I wish I could have seen the fireworks! The roof was closed, so we heard them but didn’t see them! Our team went to the figure skating on Saturday night to cheer on Canada in the team event and show our Canadian colours. Watching figure skating wasn’t something we had experienced before, and entirely big props and respect goes out to everybody involved in that sport. It was amazing! By the way, congratulations to Rachel Homan for winning the Scotties and to Jeff Currie of Thunder Bay for winning the Northern Ontario men’s title. 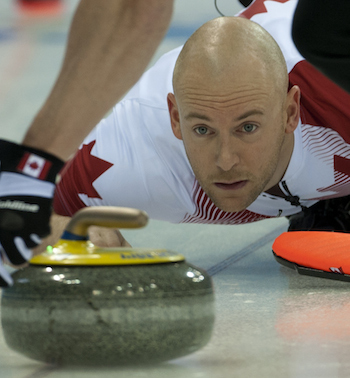 We’ll be cheering you guys at the Tim Hortons Brier in Kamloops, B.C. We have a few hours off now before we get back on the ice tonight against Switzerland. You can watch us play at 10 a.m. Eastern time on TSN!